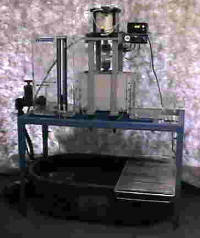 Closed cell foam rubber material are used in transmissivity testing to model the soil boundries of a drainage profile. This material does not contaminate the test water or allow “preferential” flow channels like soil/sand layers do. transmissivity device. This component is useful with very low flow conditions. 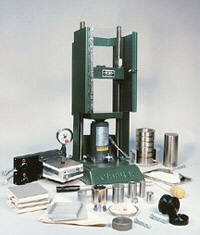 Additional Load Cells can be used to compliment the accuracy of the lower end of the load scale. These load cells can be configured with the meter provided with the Transmissivity Device. Mounting adapters will be provided with the load cells. automatically. The flow monitoring instrument panel assembly consists of 4 panel meters. The first meter acts as the controlling device for the assembly. 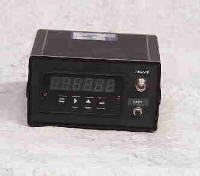 This meter is programmed to function as a control timer. The technician can select and display the amount of time desired to determine the flow rate of each of the three collection points. This time value may be set and locked out to prevent accidental changing of the collection time. The other three meters are programmed to display and hold the volume of the water collected at the completion of each collection time. (Volume over time =flow) The time and the weight (volume) of the collection will be displayed until the panel is reset upon the start of the next measurement set. Following the flow measurement, the discharge valveis opened and the water from the measuring tank is released. 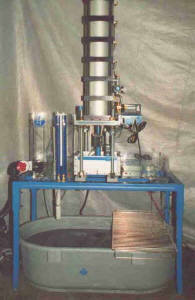 The data from the water temperature, normal load, differential pressure (gradient) can be logged throughout the test. Plus the data from the load, water temperature, gradient & the collection time and (X3) weight (volume) can be sent to the software as a report update. MeterSoft Software will connect to the same data collecting instruments. This software’s design will generate a report update of each of the programmed data points at the moment each of the water collection events occur. This will reduce the potential error of one of the data values being changed before the report update is sent to the PC. Enhances the loading characteristics of the manual loading hydraulics by allowing the loading force to be set and regulated by an air/oil system that will allow a constant pressure (load) through a 1/2″ travel of the users 4″dia loading ram. System includes precision pressure regulator and connection for the oil fittings.